Protecting Spray Insulation Foam - Leaky Roof Dr.
By now, perhaps you realize that exterior spray foam insulation has maintenance issues if it is not properly protected! When the protective coatings have started to fail, the sun’s radiant energy quickly disintegrates spray foam insulation. Protective coating systems applied over exterior spray foam insulation should always have polyester fabric incorporated into the entire roof surface while the fluid waterproofing products are applied. If water gets under your foam roof, and freezes, the foam delaminates from the surface it has been applied to. Acid is one component within foam that accelerates corrosion on steel when water gets under the foam. For long term durability, our protective waterproofing application always includes polyester reinforcing fabric across your entire foam roof surface, because for 15 cents per square foot cost of the fabric, we just doubled the life expectancy of your protective roof coating system! This custom foam waterproofing application always gives you a minimum 15 years renewable waterproof warranty and a maximum 20 years renewable waterproof warranty, depending upon which material we use to top coat your roof! This application is considered maintenance, by IRS guidelines, so it’s deducted the same year it’s paid for. Plus, with the materials we use in our coating systems, at no extra charge, these applications have been proven to out-perform 4-inch thick spray foam insulation regarding radiant heat gain! 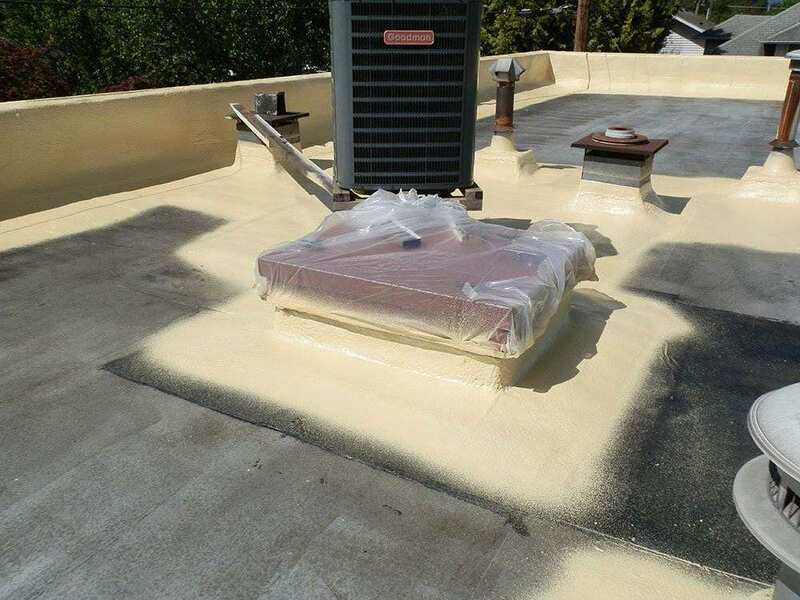 This is the last protective system your foam roof will ever need, because to renew your warranty, we simply clean your roof and apply a fresh application of our top coating!